The Sports, Tuition and Mentoring Programme, also known as S.T.A.M.P, was launched in February 2006 by Loving Heart Organisation to reach out to at-risk children and youths within a school setting. S.T.A.M.P aims to train and improve these students physically, academically, and equip them with values and life skills through 3 key components: Sports, Tuition, and Mentoring. Volunteers are welcome to help out in the Mentoring component to conduct a set curriculum of values like integrity and empathy, through games, videos, and other engaging activities. 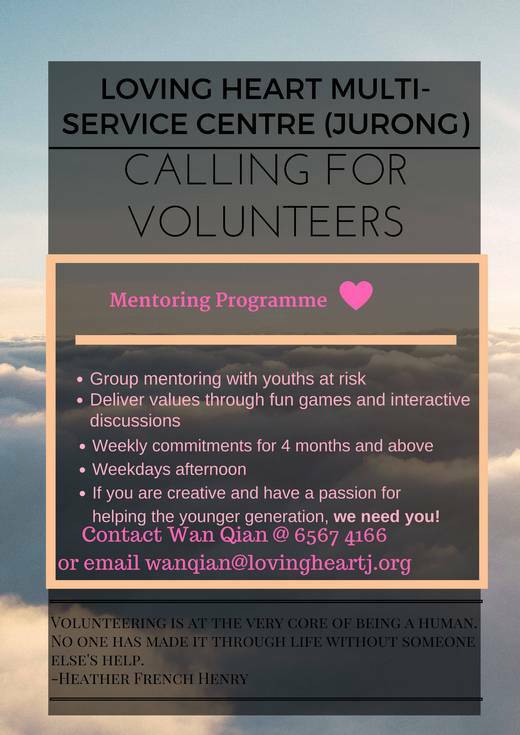 In this 4 months programme, volunteers go for mentoring sessions every Monday afternoons in the schools around the Jurong GRC. Through this mentoring session, volunteers would impart good values through fun and interesting ways to youth at risks.